When most men think of Italian menswear, the thought is of impeccable cut, sumptuous fabrics and quality that will last for years. All that and more is found at Italy’s House of Salvatore Ferragamo and in their nearly 60 stores across the world. The company’s talented head menswear designer, Massimiliano Giornetti, was recently in from his native Italy to be at Dallas at the Fashion at NorthPark Ferragamo runway fashion event. He’s helping define a new breed of style for the modern tycoon… the Ferragamo-wearing man. To envision Giornetti’s inspiration, think Rat Pack meets The Great Gatsby meets the inveterate art collecting billionaire… cool, clean and oh, so sophisticatedly decadent. Giornetti looks like an Italian Tom Ford, beautifully representing the clothes he designs. His firm conviction and not surprisingly, his devotion to men’s clothing, is based on his affinity for art. In an exclusive to Brilliant, he shares how he defines the current state – and the future - of men’s fashion. And how to look like a billion dollars. Lance Avery Morgan: Massimiliano, you are with a fashion house that has legendary style. Do you feel connected to the Ferragamo past? 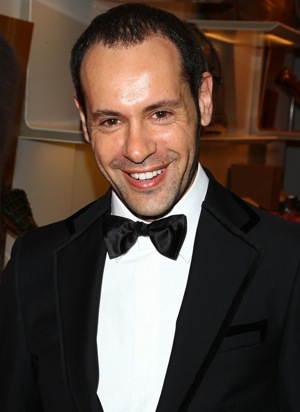 Massimiliano Giornetti: I‘m really proud to work for Ferragamo and its traditions, with all it’s genius supporting it. It all starts from that. I think the future should share something with the past, but in a brand new way. And more refined. LAM: Is your Italian customer different from your American customer? MG: I don’t see much difference. People are looking for the quality. I’m excited about the American customer. When I see what is selling in Texas, it’s something I want to wear. The main difference is the weather – you have no winters. So there’s not as much reason to wear too much cashmere. And both customers are looking for the tradition, too. LAM; I’m impressed by collection’s silhouette. MG: Silhouette is very important. I don’t think, for men, fashion is connected to decadence. I don’t like that. I like, for instance, the unexpected. Knitwear over a jacket. Refined pinstripes. Mixing different fabrics. I design for the modern man and of course, still respecting the Ferragamo tradition. LAM: Who is The Ferragamo Man? MG: Ah, Ferragamo man – he’s changed a lot over the years. He started out with wearing the perfect Ferragamo shoes. He still does. And with clothing, he then experiences the clothes’ construction and tailoring. For outerwear, he is more casual and refined. I like to think of it as really contemporary with respect to the past, with sophisticated colors and fabrics for accessories. 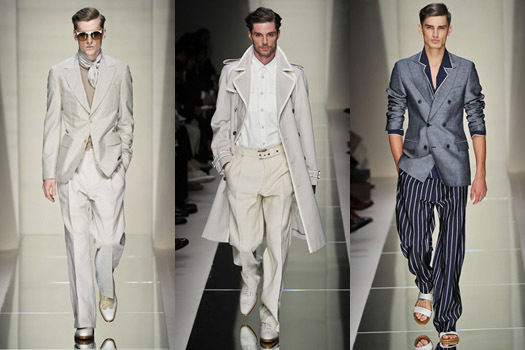 LAM: What colors will the Ferragamo man be wearing this Fall? It’s about color in accessories. An accent like a scarf in winter. A colored tie. Shoes of a different color than the suit. Dark brown, gray, navy and black are very important. All with a touch of color, like green and burgundy for Fall’s collection. Men are more brave now in playing with colors. MG: Yes, this collection is inspired by the artist, Elizabeth Peyton. Dark colors with a touch of bright color. Like her paintings. Deep orange, green, red and blue – as in the blue eyes of the subject. The attitude of men she depicts is relaxed, calm, and sophisticated. In all my work I try to connect with art. As the Ferragamos have always done. LAM: Black tie has so many interpretations these days. Not all of them good. What’s best on a man? MG: When I work with celebrities, the red carpet is very important in our menswear line. For Fall, as a change to black, I’m doing some midnightnavy. It’s extremely elegant and all about the small details. Like the lining inside and details on lapels such as velvet or silk trim. I started work in haute couture in Rome, so I am into the small details. At Ferragamo, it’s about the stitching and structure. Again, that black tie silhouette should be defined and slim fitting, but not skinny. LAM: Speaking of red carpet, which stars do you think define great style right now? MG: Justin Timberlake has cool style. Very young and fresh. As far as movie stars go, we work with Ben Affleck and Ben Stiller, who have strong personalities and like to express those personalities. They don’t buy because of the brand. Our customer is fashion conscious, but because Ferragamo suits them perfectly, it helps define who they are.